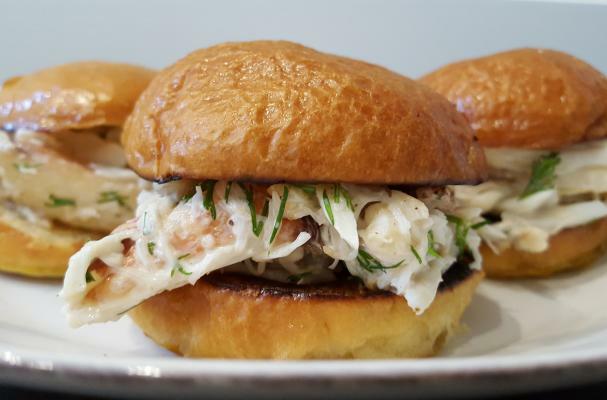 These little Dungeness Crab salad sliders were such a hit at the 4th of July party that we made them again at home. So easy, even if you don't have fresh crab - canned will work too! Mix a bit of mayo ( just enough to barely coat as you want to taste the crab, not the mayo! ), along with some finely chopped celery and dill, a few shakes of Old Bay Seasoning, and a good squeeze of lemon juice. Butter soft rolls, such as brioche buns (slider or burger size), and place on grill or in a hot pan until nicely toasted. Generously top the bottom half of each roll with the crab mixture and place the tops of the roll on to finish.